Oracle reported its fourth consecutive quarter of declining revenue on Tuesday, as rapid growth in its cloud business failed to offset the tepid demand for more traditional products. Oracle said sales of its cloud services jumped 40 percent in the quarter ended Feb. 29, to $735 million, led by its platform-as-a-service and software-as-a-service offerings. But those cloud services accounted for only 8 percent of its overall business, and when it came to the hardware and software that customers install in their own data centers, the picture was less rosy. Sales of Oracle's on-premises software, including its database and ERP products, fell 4 percent from last year to $6.3 billion, the company said. Hardware sales fell 13 percent to $1.1 billion. The results were pulled down by the strong U.S. dollar, but even allowing for the currency impact, hardware sales declined and software revenue was flat. The challenge Oracle faces is that businesses are shifting spending to the cloud and away from equipment they install in house. Oracle needs to make sure it captures a large chunk of that cloud spending, and doesn't lose it to rivals like Amazon and Workday. "Our customers are not going to leave us," Chairman Larry Ellison said during Oracle's earnings call. "On the contrary, they're going to move a lot of what they have to the Oracle cloud." There are some positive signs. Oracle added 942 new SaaS customers last quarter, CEO Mark Hurd said, bringing the total to 11,000. He rattled off a long list of names to make his point, including Blue Shield of California and Japan Airlines. 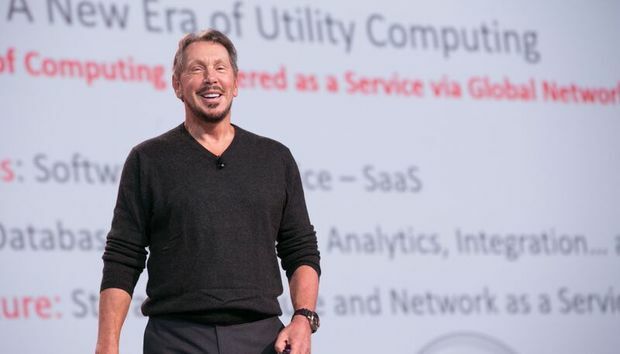 Oracle has more than 10 times the number of ERP customers as Workday, Ellison bragged. And it plays in areas that Salesforce.com does not, like human resources management. But the trends overall haven't been good. Oracle's net profit has been flat or down for eight straight quarters now, and even allowing for the strong dollar, its net profit fell 8 percent in the recent period. Revenue overall last quarter was $9.0 billion, down 3 percent from the year before and slightly lower than analysts had expected, according to Thomson Reuters. Excluding one-time charges, earnings per share was $0.64, which was slightly better than expected. That pushed Oracle's stock 4 percent higher in after hours trading, to $40.34. Oracle isn't known as being the easiest vendor to work with, and Safra Catz, who shares the CEO title with Hurd, made a vague pledge Tuesday that changes are coming. "We're aiming to be the easiest company in the business to do business with, and you're going to see some very good, positive changes that we think customers will love," she said. She didn't elaborate, and an Oracle spokeswoman didn't reply to a request for comment.